Edward John Izzard (/ˈɪzɑːrd/; born 7 February 1962) is a British stand-up comedian, actor, writer and political activist. His comedic style takes the form of rambling whimsical monologue and self-referential pantomime. He had a starring role in the television series The Riches as Wayne Malloy and has appeared in films such as Ocean's Twelve, Ocean's Thirteen, Mystery Men, Shadow of the Vampire, The Cat's Meow, Across the Universe, Valkyrie and Victoria & Abdul. He has also worked as a voice actor in The Wild, Igor, The Chronicles of Narnia: Prince Caspian, Cars 2 and The Lego Batman Movie. Izzard has cited his main comedy role model as Monty Python, and John Cleese once referred to him as the "Lost Python". In 2009, he completed 43 marathons in 51 days for Sport Relief despite having no prior history of long-distance running. He has won numerous awards including a Primetime Emmy Award for Individual Performance in a Variety or Music Program for his comedy special Dress to Kill, in 2000. Izzard's website won the Yahoo People's Choice Award and earned the Webby Award. Izzard is openly "straight transvestite" having cross-dressed both on and offstage. Izzard has campaigned for various causes and has been a Labour Party activist for most of his life. He twice attempted to be elected for a seat on Labour's National Executive Committee. When Christine Shawcroft resigned in March 2018, he automatically took her place. Edward John Izzard was born on 7 February 1962 in the Colony of Aden, the younger son of British parents Dorothy Ella and Harold John Michael Izzard. The family name is of French Huguenot origin. His mother was a midwife and nurse, while his father was an accountant who was working in Aden with British Petroleum at the time of Izzard's birth. When Izzard was one year old, the family moved to Northern Ireland, settling in Bangor, County Down and living there until Izzard was five. The family then moved to Wales, where they lived in Skewen, West Glamorgan. Izzard's mother died of cancer when Izzard was six and his brother, Mark, was eight. He and his brother built a model railway to occupy their time while their mother was ill (it was donated to Bexhill Museum in 2016). Following his mother's death, Izzard attended boarding schools such as St John's School in Porthcawl, Mid Glamorgan, as well as St Bede's Prep School and Eastbourne College. He said that he knew he was a transgender person at the age of four, after watching another boy being forced to wear a dress by his sisters, and knew he wanted to be an actor at the age of seven. Izzard began to toy with comedy at the University of Sheffield, with student friend Rob Ballard. After leaving his accountancy degree course, he and Ballard took their act to the streets, often in Covent Garden. After his split with Ballard, Izzard spent a great deal of the early 1980s working as a street performer in Europe and the United States. Izzard says that he developed his comedic voice by talking to his audience while doing solo escape acts after splitting with Ballard. He then moved his act into the stand-up comedy venues of Britain. His first gig was at the Banana Cabaret in Balham, London. In 1987, he made his first stage appearance at the Comedy Store in London. He refined his material throughout the 1980s, and in the early 1990s he finally began earning some measure of recognition through his improvisation, in part at his own club "Raging Bull" in Soho. Izzard speaks French and has performed stand-up shows in the language; from 2014 he began to perform in German, Spanish, Russian and Arabic, all languages that he did not previously speak. In 1994, Izzard made his West End drama debut as the lead in the world premiere of David Mamet's The Cryptogram with Lindsay Duncan, in the production at London's Comedy Theatre. The success of that role led to his second starring role in David Beaird's black comedy 900 Oneonta. In 1995, he portrayed the title character in Christopher Marlowe's Edward II. In 1998 Izzard appeared briefly on stage with the Monty Python team in The American Film Institute's Tribute to Monty Python (also referred to as Monty Python Live at Aspen). He walked on stage with the five surviving Pythons and he was summarily escorted off by Eric Idle and Michael Palin as he attempted to participate in a discussion about how the group got together. He has appeared in a number of episodes of BBC 1's Have I Got News For You. Izzard portrayed comedian Lenny Bruce in the 1999 production of Julian Barry's 1971 play Lenny. In 2001, he replaced Clive Owen in Peter Nichols' 1967 play A Day in the Death of Joe Egg at the Comedy Theatre. Izzard and Victoria Hamilton then repeated their lead roles when the show was brought to Broadway in 2003, with the Roundabout Theatre Company production. The revival received four Tony Award nominations including Best Revival of a Play, Best Leading Actor and Actress for its stars Izzard and Hamilton in their Broadway debuts, and Best Direction for Laurence Boswell. In June 2010, Izzard replaced James Spader in the role of Jack Lawson in David Mamet's play Race on Broadway. Izzard has appeared in numerous films, starting with 1996's The Secret Agent. He has appeared as several real-life individuals, including Charlie Chaplin in The Cat's Meow, actor Gustav von Wangenheim in Shadow of the Vampire and General Erich Fellgiebel in Valkyrie. Other roles have included Mr. Kite in Across the Universe, Lussurioso in Revengers Tragedy and criminal expert Roman Nagel in Ocean's Twelve and Ocean's Thirteen. Voice work has included the titular It in Five Children and It, Nigel in The Wild and the mouse warrior Reepicheep in The Chronicles of Narnia: Prince Caspian. He said in 2009 that he would not be reprising his role as Reepicheep and the role was ultimately played by Simon Pegg in The Chronicles of Narnia: The Voyage of the Dawn Treader. He has stated he felt he learnt to act whilst working on the film Circus. Izzard appeared in the 2009 BBC science fiction miniseries The Day of the Triffids based on the 1951 novel, alongside Jason Priestley, Vanessa Redgrave, Joely Richardson, Dougray Scott and Brian Cox. Izzard presented the medals to the athletes who had won the 800m T54 race at the London 2012 Paralympic Games, including gold medalist David Weir. He played Dr. Hatteras, a sceptical psychology professor, in the Showtime series United States of Tara and appeared in six episodes of the 2013–15 American psychological thriller–horror television series Hannibal as Dr. Abel Gideon. In June 2017 Izzard read extracts from his autobiography Believe Me for BBC Radio 4's Book of the Week. Izzard uses a stream-of-consciousness delivery that jumps between topics. As he put it in a 2004 interview with The Guardian, "It's the oral tradition. Human beings have been doing it for thousands of years". His bent towards the surreal even went so far as to produce a sitcom called Cows in 1997 for Channel 4, a live action comedy with actors dressed in cowsuits. Izzard has engaged in campaigning work. He is especially well known as a pro-European Union campaigner, supporting the further integration of the UK into the EU. In May 2005, he appeared on the BBC's political debate show Question Time, describing himself as a "British-European", comparing this with other cultural identities such as "African-American". As part of his integration campaigning, he was one of the first people to spend a Euro in London. This pan-European approach has influenced his work; he regularly performs in French and occasionally in German. On 16 June 2017, on the "Overtime" segment of HBO political talk show Real Time with Bill Maher, Izzard claimed to be working in four languages: Spanish, German, French and English. In July 2003, Izzard received an honorary Doctorate of Letters from the University of East Anglia, Norwich, for "pro-Europe campaigning", "his contribution to promoting modern languages and tolerance of other cultures and lifestyles", and for having "transcended national barriers" with his humour. He has also campaigned unsuccessfully against the closure of the departments of Drama and Languages, Linguistics and Translation at the University of East Anglia, although the department of Drama was later reprieved. In 1998, Izzard was named in a list of the biggest private financial donors to the Labour Party. He appeared in a party political broadcast for the Labour Party in the run-up to the 2005 general election. He donated nearly £10,000 to the party in 2008, appeared again in a party political broadcast for the 2009 European election, and again in a 2010 election video entitled Brilliant Britain. 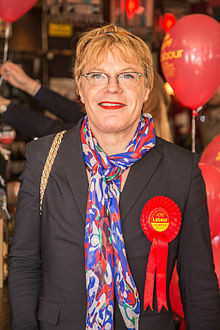 Izzard appeared in literature to support changing the British electoral system from first-past-the-post to alternative vote for electing Members of Parliament to the House of Commons in the Alternative Vote referendum in 2011. In 2011, Izzard revealed that he had political ambitions and wanted to become an MP, Mayor, or MEP by 2020. On 25 February 2016, Izzard announced his intention to stand for the National Executive Committee of the Labour Party. It was announced on 9 August 2016 that Izzard had failed to be elected to the NEC. On 20 July 2006, he received an honorary doctorate in Letters from the Faculty of Arts at the University of Sheffield, where he spent one year on an Accounting and Financial Management course in the early 1980s. During his time at the university he established the now-defunct Alternative Productions Society in the Union of Students with the aim of promoting fringe-based arts. On 4 March 2010, he was elected as the Honorary President of the University of Sheffield Students' Union. On 7 July 2007, Izzard was one of the presenters from the London leg of Live Earth. During an interview for the 2008 Stripped tour, he spoke about becoming more active in European politics as well as running for political office in Europe within the next decade. Izzard added a stop in New Orleans during his 2008 Stripped tour. All proceeds from the performance of 23 June 2008 were donated to Neighbourhood Housing Services of New Orleans. In March 2014, Izzard began leading a campaign encouraging Scottish people not to vote for independence in the September referendum, saying that England would feel a "deep sense of loss" if Scotland were to leave the UK. Izzard is an outspoken supporter of the Labour Party. In September 2011, he declared his ambition to stand for the party in the future as an MP, MEP, or Mayor of London, announcing an intention to stand for the London mayoral election in 2020. When asked on comedy panel show The Last Leg why he thought he might be elected, he replied "Boris Johnson". He is also a republican, believing that Britain should have a democratically elected head of state. He has stated that he is a social democrat, not a socialist. Izzard confirmed his support for Labour in the 2015 general election, attending a party rally with fellow comedian Ben Elton and actress Sally Lindsay in April 2015. On 27 July 2009, with only 5 weeks' training and no significant prior running experience, Izzard began seven weeks of back-to-back marathon runs (with Sundays off) across the UK to raise money for Sport Relief. He ran from London to Cardiff to Belfast to Edinburgh and back to London, carrying the flag of the country — England, Scotland, or Wales — in which he was running. In Northern Ireland he carried a self-designed green flag bearing a white dove. The blog Eddie Iz Running documented his 43 marathons in 51 days, covering at least 27 miles per day (totaling more than 1,100 miles), ending on 15 September 2009. He received a special award at BBC Sports Personality of the Year in 2009 for his achievements. In March 2010, Izzard took part in the Sport Relief Mile event. On 16 February 2016 the BBC announced that Izzard would attempt to run 27 marathons in 27 days, through South Africa for Sport Relief. The significance of the number 27 came from the number of years spent in prison by Nelson Mandela. In total Izzard would aim to run more than 700 miles, in temperatures of up to 40 °C. Izzard completed his first marathon on 23 February. He attempted such a project in South Africa in 2012, but withdrew with health concerns. He completed the marathon challenge on 20 March, at the statue of Mandela in front of the Union Buildings in Pretoria. Because he had spent one day in hospital, he had to run two consecutive marathons on this last day. He raised more than £1.35M for Sport Relief. A BBC documentary, detailing his feat, was broadcast on 28 March. In May 2017, Izzard declared his intention to become a Labour politician after endorsing Labour Party leader Jeremy Corbyn in the 2017 UK general election. He said: "I like Jeremy Corbyn. He believes in what he says." In October, he announced a renewed bid for election to Labour's National Executive Committee. In January 2018, it was announced that Izzard had failed in his second bid to be elected to the NEC. On 31 March 2018, Christine Shawcroft resigned from the Labour Party's NEC. Izzard automatically replaced her and served until the next NEC election, held in summer 2018. Izzard came 9th in that election and so was not re-elected to the NEC. During his 2008 Stripped tour, Izzard said he realised he was an atheist. He said, "I was warming the material up in New York, where one night, literally on stage, I realised I didn't believe in God at all. I just didn't think there was anyone upstairs." He has since described himself as a spiritual atheist, saying, "I don't believe in the guy upstairs, I believe in us." Izzard keeps his romantic life private, citing the wishes of his companions not wanting to become content for his show. He dated Sarah Townsend, who later directed the documentary Believe: The Eddie Izzard Story, and whom he first met while she was running a Fringe venue at the Edinburgh Festival in 1989. Izzard supports Crystal Palace FC and became an associate director at the club on 16 July 2012. Izzard started to freely talk about his transvestism in venues such as the Edinburgh Festival as early as 1992. His stance is that cross-dressing is neither part of his performance nor a sexual fetish. He remarks in his show Unrepeatable that "women wear what they want and so do I". According to Izzard, "Most transvestites fancy women." He calls himself "a straight transvestite, or male lesbian". He has also said he is "a lesbian trapped in a man's body", transgender, and "a complete boy plus half girl". He has expressed a belief that being transgender is caused by genetics and that someday this will be scientifically proven, having gone so far as to have his own genome sequenced. On 18 March 2007, Izzard was listed as number 3 of the 100 Greatest British National Comedians (behind Peter Kay at number 2 and Billy Connolly at number 1) as part of British television station Channel 4's ongoing 100 Greatest..., series. In the 2010 updated version of the list he was ranked 5th. In 2012, he received an honorary doctorate from the University of Sunderland. On 20 February 2013, Izzard received the 6th Annual Outstanding Lifetime Achievement Award in Cultural Humanism — an award presented at Harvard University each year by the Humanist Community at Harvard, the American Humanist Association, and the Harvard Community of Humanists, Atheists, and Agnostics. In 2015 Izzard was chosen, by readers of The Guardian, as their 2014 public language champion. The award was announced in central London, at the Guardian and British Academy 2014 Schools Language Awards, as part of the annual Language Festival. On 20 November 2018 he was awarded a Honorary Doctorate of Letters (D.Litt) from York St John University. Believe Me: A Memoir of Love, Death and Jazz Chickens (2017), Michael Joseph, ISBN 978-0718181727. 1996 Tales from the Crypt Evans Episode: "Confession"
2010 The Simpsons Nigel Bakerbutcher / Elizabeth II / Prince Charles (voices) Episode: "To Surveil with Love"
2011 The Good Wife James Thrush Episode: "The Death Zone"
^ a b c Sweeney, Eamon (27 November 2009). "Living the dream: Eddie Izzard". The Irish Independent. Retrieved 8 May 2011. ^ Heald, Claire (15 September 2009). "Run, Izzard, run and run again". BBC. Retrieved 8 May 2011. ^ "Izzard beats bus shelter website to award". Izzard beats bus shelter website to award. London, UK. 16 January 2004. ^ "People's Voice Winner". Archived from the original on 24 January 2010. ^ a b c Garfield, Simon (27 May 2001). "Frock tactics". The Observer. UK. Retrieved 10 May 2011. ^ a b c d e Ann Low, Lenny (20 January 2009). "Not just a pretty face". The Sydney Morning Herald. Retrieved 8 May 2011. ^ a b Bono (16 May 2006). "Eddie Izzard: 'We need Europe to be a melting-pot. We need to melt'". The Independent. UK. Retrieved 17 April 2009. ^ "Huguenots among most successful of Britain's immigrants". The Independent. Retrieved 15 March 2016. ^ a b James, Caryn (16 March 2008). "Eddie Izzard's Master Plan". The New York Times. Retrieved 18 April 2008. ^ a b c Farndale, Nigel (30 July 2006). "I'm all boy". The Daily Telegraph. UK. Retrieved 8 May 2011. ^ Neil, Beth (13 August 2009). "Eddie, steady, go". Daily Mirror. London. Retrieved 2 May 2011. ^ "Eddie Izzard opens museum exhibit of childhood model railway". BBC News. 12 July 2016. ^ a b Brownfield, Paul (11 June 2000). "Where He'll Stop, Nobody Knows". Los Angeles Times. Retrieved 10 May 2011. ^ Ciaran Brown (26 September 2006). "Ciaran Brown meets actor and comedian Eddie Izzard". Ciaranbrown.com. Retrieved 14 August 2012. ^ "Olympic Torch Relay – Live Relay". BBC. Retrieved 13 July 2013. ^ Jennifer ruby (15 March 2016). "Eddie Izzard gives inspiring speech on being transgender as he takes a break from marathon to get his nails done | Showbiz". London Evening Standard. Retrieved 28 March 2016. ^ "Eddie Izzard on Q TV". 15 June 2010. Retrieved 13 July 2013 – via YouTube. ^ a b Appleyard, Bryan (18 July 1999). "The King of Comedy". The Sunday Times. Culture 2. ^ a b Taylor, James C. (24 January 2010). "Eddie Izzard works in 'boy mode'". Los Angeles Times. Retrieved 10 May 2011. ^ a b c Burrell, Ian (16 December 2010). "Tears are never far from ruining the make-up of Eddie Izzard". The Independent. UK. Retrieved 10 May 2011. ^ a b c Dessau, Bruce (19 December 2003). "Going for bust". London Evening Standard. UK. Archived from the original on 5 May 2013. Retrieved 10 May 2011. ^ Izzard, Eddie; Simon Amstell (11 February 2009). "Did You Die On Stage for Years?" (audio). Live from London: Eddie Izzard. Did You Die On Stage for Years? : iTunes Store. Retrieved 10 May 2011. ^ Fleckney, Paul (5 August 2014). "Où est le punchline? The art of standup in a second language". The Guardian. ISSN 0261-3077. Retrieved 23 February 2016. ^ "Grappling German grammar, Eddie Izzard proves humor can travel". Reuters. 29 January 2014. Retrieved 23 February 2016. ^ Taylor, Paul (1 July 1994). "THEATRE / Another piece of the puzzle: Paul Taylor on David Mamet's The Cryptogram, with Lindsay Duncan and the comedian Eddie Izzard". The Independent. London. ^ "Monty Python – Live At Aspen – 1998". British Classic Comedy. 8 April 2014. Retrieved 25 February 2016. ^ Brantley, Ben (30 June 2010). "A New Team Tackles Mamet's Moral Fable of Pride, Prejudice and Susceptibility". The New York Times. Retrieved 9 May 2011. ^ acast (12 September 2017). "Eddie Izzard - Distraction Pieces Podcast with Scroobius Pip #168 | Distraction Pieces Podcast with Scroobius Pip on acast". acast. Retrieved 13 September 2017. ^ "Vanessa Redgrave to star in BBC's The Day of the Triffids". The Daily Telegraph. London. 11 February 2009. Retrieved 17 April 2009. ^ "The Independent sports quiz of the year". 26 December 2012. ^ a b Fienberg, Daniel (2 May 2011). "Eddie Izzard talks 'United States of Tara' and more". hitfix.com. Retrieved 8 May 2011. ^ Bullock, Andrew (6 June 2016). "EXCLUSIVE: 'It's unfortunate' Eddie Izzard says Hannibal should not have been axed by NBC". Retrieved 31 March 2018. ^ "Episode 1, Believe Me, Book of the Week - BBC Radio 4". BBC. ^ Bedell, Geraldine (3 October 2004). "'Mentally, I'm all boy – plus extra girl'". The Guardian. UK. Retrieved 17 April 2009. ^ "Cake or death: an Eddie Izzard site: the biography". Auntiemomo.com. Retrieved 17 April 2009. ^ "University of East Anglia: Events and News: Eddie Izzard". 2007. Retrieved 26 March 2008. ^ Curtis, Polly (18 May 2004). "Eddie Izzard leads charge against course closures". The Guardian. Retrieved 12 October 2017. ^ "'Luvvies' for Labour". BBC News. 30 August 1998. Retrieved 1 May 2010. ^ "Feature: Political celebrities". Politics.co.uk. Archived from the original on 25 January 2009. Retrieved 17 April 2009. ^ Eddie Izzard Tells 'The Green Room' That He Wants to Be a Politician. The Green Room with Paul Provenza. 1 September 2011. Retrieved 2 December 2011. ^ Izzard, Eddie (25 February 2016). "Eddie Izzard on why he's standing for Labour's National Executive Committee". ^ "Eddie Izzard's kiss of death catches up with him | Coffee House". 8 August 2016. Retrieved 9 August 2016. ^ "Latest News". Shef.ac.uk. Archived from the original on 9 July 2009. Retrieved 17 April 2009. ^ "Elections Results 2010". Sheffield Students' Union. Archived from the original on 20 February 2010. Retrieved 5 March 2010. ^ "Eddie Izzard Adds New Orleans to Tour; Show to Benefit Housing Services – St. Tammany Art Association". Blog.nola.com. 10 June 2008. Retrieved 17 April 2009. ^ Selby, Jenn (18 March 2014). "Eddie Izzard campaigns against Scottish Independence". The Independent. ^ Eddie Izzard: 'I will run for mayor, MEP or MP in 2020'. BBC, 28 September 2011. ^ Marchant, Rob (29 August 2013). "Who will be Labour's next Mayor of London". The Independent. Retrieved 19 September 2013. ^ Cockerton, Paul (14 May 2013). "Eddie Izzard on his hopes to be Labour London Mayor and how Margaret Thatcher 'revelled' in throwing people on scrapheap". mirror. Retrieved 12 October 2017. ^ Eddie Izzard will run for London Mayor in 2020. 3 News NZ. 26 September 2013. ^ Sherwin, Adam (26 August 2014). "Being a transvestite has toughened me up for politics, says Izzard". The Independent. London. Retrieved 6 February 2015. ^ Edemariam, Aida (2 December 2008). "Aida Edemariam talks to Eddie Izzard about serious acting and his return to comedy". The Guardian. Retrieved 25 February 2016. ^ Elton, Ben (4 April 2015). "Comedian Ben Elton hits out at Myleene Klass over her mansion tax claims". The Guardian. Retrieved 23 April 2015. ^ "Donate and Sponsor". Comic relief. Archived from the original on 7 March 2010. Retrieved 1 April 2010. ^ "Eddie Izzard given BBC Sports Personality special award". BBC Sport. 13 December 2009. Retrieved 13 December 2009. ^ Nikkhah, Roya (21 March 2010). "Thousands prepare for mile run as Sport Relief raises record amount". The Daily Telegraph. London, UK. Retrieved 1 April 2010. ^ "Eddie Izzard completes first of 27 marathons for Sport Relief". BBC News. 15 February 2016. Retrieved 25 February 2016. ^ "Izzard completes marathons challenge". BBC News. 20 March 2016. ^ "Eddie Izzard: Marathon Man for Sport Relief". BBC. 28 March 2016. Retrieved 28 March 2016. ^ Bishop, Christiana (20 May 2017). "Eddie Izzard declares ambition to become Labour Party politician after supporting Jeremy Corbyn". The Independent. Retrieved 11 June 2017. ^ Mason, Rowena (23 October 2017). "Eddie Izzard champions diversity in bid to join Labour NEC". The Guardian. Retrieved 3 December 2017. ^ Elgot, Jessica (16 January 2018). "Eddie Izzard says Labour infighting must end after NEC defeat". The Guardian. Retrieved 16 January 2018. ^ "Anti-Semitism row official quits Labour NEC". BBC. 31 March 2018. Retrieved 31 March 2018. ^ "Eddie Izzard snatches defeat from the jaws of victory". 3 September 2018. ^ a b Armstrong, Stephen (8 February 2009). "Eddie Izzard: Hollywood to House of Commons?". The Times. UK. Retrieved 2 August 2010. ^ Hoggard, Liz (24 November 2010). "Interview: Sarah McGuinness, singer and producer". The Scotsman. UK. Retrieved 10 May 2011. ^ CrystalPalaceFC_user. "Izzard Becomes Associate Director". Retrieved 6 February 2015. ^ Visco, Gerry (May 2014). "Eddie Izzard, Force of Nature". Interview. Retrieved 22 May 2014. ^ Izzard, Eddie; Jordan, Lawrence (1999). Dress to Kill (DVD)|format= requires |url= (help). WEA Corp.
^ a b "Eddie Izzard: The tough transvestite who can take care of himself". The Independent. London, UK. 23 May 2004. Retrieved 23 July 2016. ^ "Comic Izzard promoting life story". BBC. 17 May 2004. Retrieved 10 May 2011. ^ Eddie on coming out as transgender - Eddie Izzard: Marathon Man - BBC Three (YouTube video). BBC. 14 March 2016. Retrieved 9 August 2018. ^ Nicola Weatherall, "Sunderland University to honour Eddie Izzard, Charlie Spedding and Alastair Stewart", journallive.co.uk, 5 July 2012. Retrieved 16 May 2014. ^ "Eddie Izzard: Lifetime Achievement Award: The Humanist Community Project". Harvardhumanist.org. 23 January 2013. Retrieved 13 July 2013. ^ "Eddie Izzard accepts the Outstanding Lifetime Achievement Award in Cultural Humanism on Vimeo". 25 February 2013. Retrieved 13 July 2013 – via Vimeo. ^ "The Humanist Community Project | From the Humanist Chaplaincy at Harvard". Harvardhumanist.org. Retrieved 13 July 2013. ^ Holly Young. "Eddie Izzard named public language champion". The Guardian. Retrieved 6 February 2015. ^ "Doctorate for comedian Eddie Izzard". ^ "Believe Me, A Memoir of Love, Death and Jazz Chickens by Eddie Izzard". penguin.co.uk. ^ "Eddie Izzard: Live At Madison Square Garden: Eddie Izzard, Largo: Movies & TV". Retrieved 25 February 2016. Heilpern, John (June 2013). "Out to lunch with Eddie Izzard". Vanity Fair. 634: 34. Wikimedia Commons has media related to Eddie Izzard. It's stupid and I love it – the Goon Show and me – The Guardian, 14 February 2005. 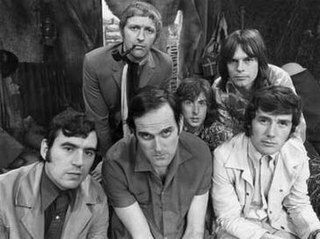 Monty Python were a British surreal comedy group who created their sketch comedy show Monty Python's Flying Circus, which first aired on the BBC in 1969. Forty-five episodes were made over four series. The Python phenomenon developed from the television series into something larger in scope and impact, including touring stage shows, films, numerous albums, several books, and musicals. The Pythons' influence on comedy has been compared to the Beatles' influence on music. Their sketch show has been referred to as "not only one of the more enduring icons of 1970s British popular culture, but also an important moment in the evolution of television comedy". Terence Graham Parry Jones is a Welsh actor, writer, comedian, screenwriter, film director and historian, best known as a member of the Monty Python comedy troupe. 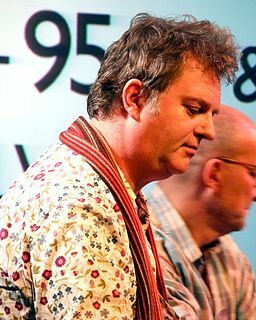 Paul James Martin, known professionally as Paul Merton, is an English writer, actor, comedian, radio and television presenter. Ricky Dene Gervais is an English stand-up comedian, actor, director, screenwriter and singer. Martin John Christopher Freeman is an English actor and comedian, known for portraying Bilbo Baggins in Peter Jackson's The Hobbit film trilogy (2012–2014), Tim Canterbury in the original UK version of sitcom mockumentary The Office (2001–2003), Dr. John Watson in the British crime drama Sherlock (2010–present), and Lester Nygaard in the dark comedy-crime drama TV series Fargo (2014). Russell Edward Brand is an English comedian, actor, radio host, author, and activist. Robin Ince is an English comedian, actor and writer. He is best known for presenting the BBC radio show The Infinite Monkey Cage with physicist Brian Cox. Miles Hugh Barrett Jupp is an English comedian and actor. Beginning his career as a stand-up comedian, before playing the role of the inventor Archie in the British children's television series Balamory. His also appearanced on comedy panel shows, and played John Duggan in The Thick of It and Nigel in the sitcom Rev. Jason John Manford is an English comedian, television presenter and radio presenter. Marsha Shandur is a former radio presenter best known for presenting on Xfm London and Xfm Manchester. The BBC Sports Personality of the Year is an awards ceremony that takes place annually in December. Devised by Paul Fox in 1954, it originally consisted of just one, the BBC Sports Personality of the Year Award. Several new awards have been introduced, and currently eight awards are presented. The first awards to be added were the Team of the Year and Overseas Personality awards, which were introduced in 1960. A Lifetime Achievement Award was first given in 1995 and again in 1996, and has been presented annually since 2001. In 1999, three more awards were introduced: the Helen Rollason Award, the Coach Award, and the Newcomer Award, which was renamed to Young Sports Personality of the Year in 2001. The newest is the Unsung Hero Award, first presented in 2003. In 2003, the 50th anniversary of the show was marked by a five-part series on BBC One called Simply The Best – Sports Personality. It was presented by Gary Lineker and formed part of a public vote to determine a special Golden Sports Personality of the Year. That year Steve Rider and Martyn Smith wrote a book reflecting on the 50-year history of the award and the programme. The event was held outside London for the first time in 2006, when tickets were made available to the public. John Joseph Bishop is an English comedian, presenter and actor, who is also known for his charity work, having raised £4.2m for Sport Relief 2012. Paul Foot is an English comedian. Foot is known for his musings, rants, "disturbances" and apparent aversion to pop culture. The Daily Express likened him to "a rare exotic bird", and six national newspapers including The Independent and The Age have described him as "a comedy genius".